What makes great businesses tick? How can you create a culture that is inclusive, fun and highly productive? What is the secret sauce that separates the ordinary from the extraordinary? These questions are answered in a business fable that tracks Lynn’s journey to complete a grad school assignment. She visits Ozzie Optics, a very successful start-up and learns their secret – the enterprise-wide adoption of the tools and principles associated with Agile, a methodology typically tied to software development. By visiting with leaders in Finance, Sales, Marketing, HR, Operations and Account Management, Lynn learns the truly transformational power of Agile and how it can change all organizations in profound and positive ways. 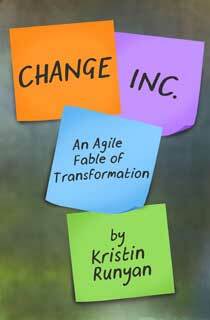 In Change, Inc., Kristin Runyan makes the subject of Agile relatable by telling the story in a way that is easy to understand and easy to apply. Runyan not only describes each of the Agile tools, like Progress Board and Fist of Five, but also provides practical application tips to immediately start using these tools in both your personal and professional life.